As prisons go, it's a relatively pleasant one. The Sheshan seminary can be found on a quiet leafy lane that could just as well be in Tuscany as its true location, the outskirts of Shanghai. There is no barbed wire in sight and no guards, just a solitary, rather friendly watchman on the front gate. Nonetheless it is, as our inquiries confirm, being used for the effective confinement of China's missing bishop, Thaddeus Ma Daqin. Friends of Bishop Ma whom I spoke to told me that he does enjoy certain limited freedoms. He can get permission to come and go from the seminary, they said, but not to leave the wider Shanghai area. And, as his followers will know, he's been allowed to keep his internet blog updated, although most of the postings are simple, biblical quotes that shed little light on his well-being. But while he may not be shackled to his bed, his enforced "retreat" continues and, after almost 18 months, the authorities have still not finished with him. Bishop Ma, we learnt, is being sent to political lessons - communist indoctrination by any other name - three times a week. In July last year Bishop Ma did a very rare thing: he appeared to publicly challenge the authority of the Communist Party to control the Catholic Church. In Shanghai's Catholic cathedral, in front of a large congregation including party officials, he used his ordination speech to announce his resignation from the Catholic Patriotic Association (CPA). The CPA has governed the church in China since 1957, co-opting it into the structure of the state and ensuring that it is unable to become an alternative centre of power. To any outside observer, Bishop Ma's declaration may not have looked all that defiant. He wanted to focus all his energies on being a bishop, he said, so it would no longer be "convenient" to continue with the dual role of being a bureaucrat. But in the eyes of the Chinese authorities it was an extraordinary statement of independence and they moved swiftly against the priest. He was reportedly taken straight to Sheshan and has not been seen in public since. The subsequent announcement that he has been stripped of the title of bishop has been strongly contested by Rome. 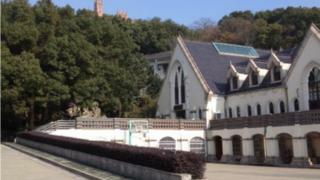 On the hill above the seminary stands the red brick Sheshan Basilica with its elegant domed bell tower. Since it was completed in 1935 it has been witness to the many twists and turns in the relationship between the Catholic Church and the Chinese state. During the worst of times, Chairman Mao's Cultural Revolution, the church was ransacked and the statues and stained glass windows were smashed. But over the years as the Basilica was gradually restored so too, to a limited extent, were the relations between Rome and Beijing. Despite the lack of official diplomatic ties and the on-going mutual mistrust a kind of accommodation was reached. Throughout the 1990s and the early 2000s many of the bishops selected by the Catholic Patriotic Association were also approved by The Vatican. But in recent years, that tacit deal started to unravel and Beijing has pushed ahead with the ordination of a number of bishops that do not enjoy the support of Rome. Some observers suggest that relations are now as troubled as they've been in decades and the Sheshan seminary finds itself at the centre of the crisis. Bishop Thaddeus Ma Daqin - a man who up until his ordination speech was one of the those bishops acceptable to both sides - is now a symbol of the continuing divide. The issue highlights a long running debate in the Catholic Church about how best to deal with China. It brings back painful memories of the Vatican's own version of Ostpolitik in the 1960s when it muted its criticism of the Soviet Union in order to build bridges with the church behind the Iron Curtain. Catholics in China are now waiting to see what kind of a strategy Pope Francis will adopt. There are some within the wider church who would like it to do more to speak out in support of the unofficial, or underground, Chinese Catholics who pledge allegiance not to the CPA, but to Rome, and risk persecution as a result. Others suggest that dialogue is the only way forward and that means speaking to and negotiating with the CPA. But, given that China is politically, economically and diplomatically stronger than it was 10 years ago, the party may be in no mood to negotiate. It has what it wants, control, and strange as it seems, this atheist state may be even more determined to insist on the right to run the church and appoint its bishops - as well as dismiss them. We asked at the seminary if it was possible to speak to Bishop Ma. "We won't even pass on your request," we were told.